Come Christmastime, decorating the mantel makes for a festive family tradition. Whether you hang stockings o'er the chimney, as in the classic holiday poem, or use pine boughs to create an evergreen Christmas mantel, getting your home ready will bring on the holiday spirit. Try some of these tips this December for a holiday treat! Evergreens, holly berries, poinsettias and other wintry plants add a breath of freshness to the wintry scene. You may choose silk versions of the real deal, or purchase fresh greens and flowers each year. Evergreens can perfume your home for a special treat! Elements like pine cones or pomegranates add texture, color and mood to the scene. Miniature Christmas trees or rosemary shrubs cut to resemble miniature fir trees add a perfect Christmas feel. If you aren't going to have a large tree for space reasons, a mantel tree ensures it still feels like Christmas! If your mantel is too shallow to support plant pots or greens, consider creating a display of ornaments. Of course, ornaments can be added to a display of greens as well. Some pieces, such as angels, animals or Santa figures, may be able to stand alone. You might be able to nestle spherical ornaments in the greens. For a contained display, fill a tall glass vase with ornaments, then place it atop the fireplace. Incorporate other seasonal elements, such as family figurines or candles. Classic red and green make a perfect color scheme for any holiday fireplace decor, but don't feel limited to these two colors! Festive plaids incorporate reds, greens, golds and other hues. If you're prefer a subtler holiday fireplace, consider pristine white and gold, for a snowy, sophisticated color palette. Ornaments, miniature lights, candles, and white and gold stars are all elements to incorporate in a white and gold mantle. 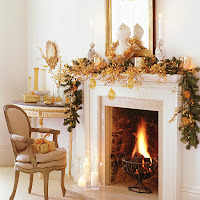 As another variation, try white and silver, or an all-metallic mantelpiece theme with bronze, gold and silver. Don't forget to leave space for the stockings! Stocking hooks allow you to slip the Christmas stockings on so they hang down over the fireplace. 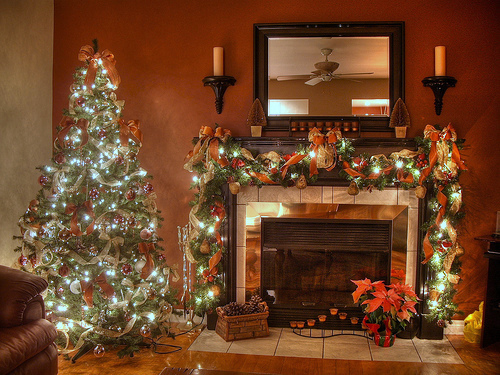 If you prefer a functional fireplace, place the stockings to one or both sides of the mantel. Finally, tie the mantel decor into the rest of your home by using decorating elements also found in other rooms. If you have a poinsettia on the dining room table, add a miniature poinsettia to the mantel. If you decorate the kitchen windowsill with holiday cards your family has received, save some cards for the mantel too. Or if your family has themed ornaments that are a Christmas tradition, such as Santa figurines, trains or bells, add this decor to the mantel too. There are so many festive elements to add to the holiday mantel, so pick a couple of your favorites and get going! If you create a display you really love, be sure to take pictures so you can do the same thing next year if you want. And happy holidays! Holly is an Indianapolis native who loves decorating her home for the seasons. She already has her Halloween decorations in full force and is carefully planning out her next few months' decor. In her spare time, she loves blogging on behalf of Sears and other great brands she uses. The mirror above the fireplace reflects the rooms ceiling fan not so attractive perhaps a wreath would be better....just saying!